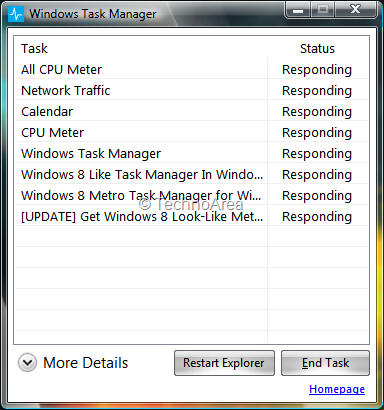 Microsoft has introduced a new Task Manager In Windows 8 It’s a metro style Task Manager which is quite sleek and minimal in design. A reader of AskVg has designed a Task Manger which is quite similar to Windows 8 one, it is sleek and minimal which comes with limited functions. It’s a portable utility, so you don’t need to install it just extract it and run it, once you run it will shows all running programs with their status.